Once in a while I get a bit..well, lazy, to be quite honest! So in order to kick start myself back into healthy mode I set myself a challenge. 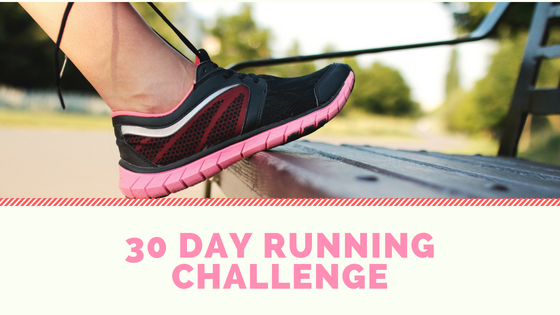 My 30 day running challenge began on the 1st of July. I’ve always loved going for a run. After work being my chosen time to go, as it really helps clear the ole’ noggin’ from a busy day and helps me relax for the evening ahead. I know that it’s not just me, for many people running is a theraputic hobby. It’s just an added bonus that it’s a great thing to do for your fitness levels too. If you’re getting stuck into the same old boring fitness schedule, or falling of the wagon with one too many summer BBQ’s, I’d definitely recommend setting yourself a 30 day challenge. It’s a long enough time to allow you to see results, but short enough so that you can keep committed. For me, doing a 30 day running challenge made loads of sense, as I already enjoy it! It’s a pretty simple concept. Run every day, for 30 days. When we’re talking 30 days, it is good to remember that each day doesn’t have to be a Mo-Farah style dash. Tune into your body so you know when you can push it and when to take it easy. If you’re weight training in between runs (like me) then some days you might be too achey to go far, so just take it easy with a light jog. 1) Footwear is super important. When I first started doing races I suffered a lot with blisters. However, making a small investment in some oxide tape and second skin socks did the trick. As long as I remember to tape up and keep my feet well moisturized they are just fine! You wouldn’t want something as trivial as a blister hampering your efforts. 2) Routes can get boring. Make sure you keep things interesting, don’t do the same run day in and day out. I combined running on treadmills with running out in the open, going to Park run each weekend with friends, or simply just trying a new route. If you keep things fresh it’s much easier to motivate yourself. 3) You will surprise yourself. At the end of my challenge I thought I would be so pleased to hang up the trainers and take a day off, but that wasn’t the case. I embraced running every day and when I did finally have that rest day at the end I missed my daily run! Don’t get me wrong, it was nice to hit the gym and not feel obliged to spend half an hour on a treadmill, but running is definitely in my blood now. I am mega proud to have covered 100 miles in a month too. All in all, it was a great positive experience to set myself up with this 30 day challenge and I would recommend it to anybody. Whatever your fitness level is, you can tailor a challenge to suit. I wasn’t 100% perfect and life did get in the way sometimes, but I just let it be and carried on as best as possible. It’s really improved my running and just proved to me that I can stick to a plan if I put my mind to it! Over the next few months I’ll be setting myself some more challenges like this one in an aim to improve my fitness levels and lifestyle. It’s worked well so far, so why not! ..Did I mention I ran over 100 miles in a month? (J.k, I know I did I just wanted to show off! That’s like..four marathons, almost!). When I started off running outdoors I wasn’t that confident, so going it alone was fine for me. Yet now I have been doing it for years I craved something slightly different. My first ever group run. On a cold, dreary Saturday morning I headed to Watford with a friend and was introduced to this great little community. Despite the fact is was seriously chilly and raining there was around 200 people there and ready to kick start their day with a jog. These events are weekly, free, and run completely by volunteers (who were all really friendly and encouraging).The course is 5k and had a range of abilities. Oh and at the end they record your time with a barcode, you get an email through telling you all your stats. Throughly impressed. In case you’re wondering, the picture below is from my second, sunnier, park run! Beer and running? You bet. 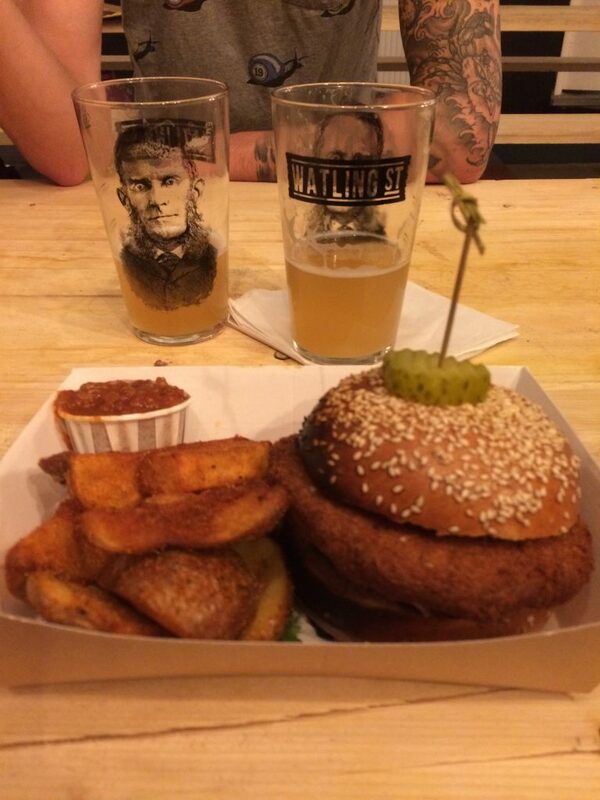 Over the weekend I happened to be enjoying a beer at the Watling Street Brewery (a great bar in Watford with the brewery attached). It was there that I was made aware of a weekly run that starts and ends at the bar, with a free pint for all runners. What a great concept. Held every Wednesday, there are three routes so great for all abilities, set on a pretty trail through parks and woods. I turned up that very Wednesday on my own. As I walked through the door I was greeted by owner, Rudi, who remembered my name and introduced me to the group, so no ice to break either. After the run everyone sets themselves along a big table to enjoy the runners high and a refreshing beer. Plates of freshly cooked steak slices are put out to nibble on, and to my relief the staff remembered I’m veggie, offering up a hearty, home made, veggie burger as an alternative. Can’t ask for much more than that! My first race. 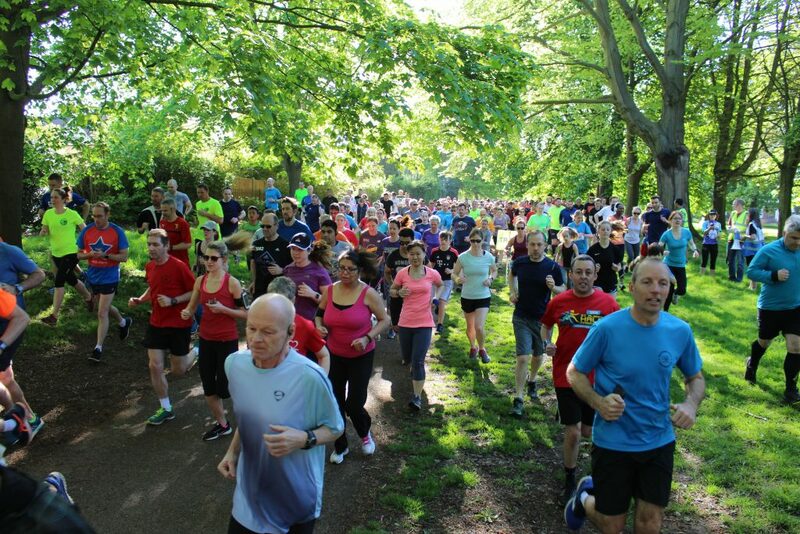 This 10k race is hosted annually by storage company Kelly’s at Cassiobury Park, Watford. Kelly’s put on the whole event so 100% of all donations go to charity. You can enter the race for free, although most make a donation to worthy cause Watford Mencap. It’s strange how the minute you turn up to a race rather than a social event it changes your outlook. On the day, I collected my number and was pysching myself up to keep a good pace. The course was very pretty and takes you through woodlands as well as the park. A great atmosphere with everyone cheering each other on, plus a medal at the end. I’ll be along next year for sure. I can’t quite believe it’s taken me so long to get out there and do some events. If you, like me, have been going it alone, I would definitely recommend joining a local club or park run. It is surprising just how many are out there. It’s sociable, motivation for when you can’t be bothered and other runners let you in on new events too. There’s also the fact that there is always someone faster to keep up with. It’s bound to do wonders for your PB times. Have I reeled off enough yet? 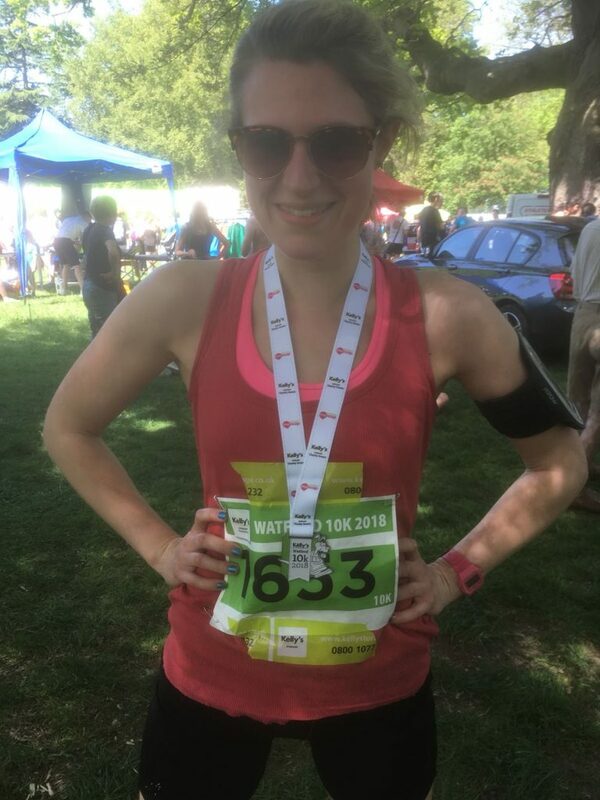 Bring on the Regents Park 10k next! Today is a pretty sad day..
Just kidding, it’s been a totally okay day (or actually, even better than totally ok, because it’s only the best day of the week..FRIDAY!). But there is something to be sad about, a little dramatic, but my gym gloves have finally kicked the bucket. I know, I know, ‘Chrissy, they’re just a nasty old pair of gym gloves..just get some news ones’. I do have some new ones, they’re actually much better quality than this lovely zebra print number. But that’s not the point. The point is that this pair of tatty gym gloves have been with me since day one. From the humble beginnings, when I first joined a gym not having a clue what to do, this pair have travelled the timeline with me. They’ve stopped more calluses and blisters than you can shake a stick at. It’s just a small reminder of how, before you know it, you can change for the better. 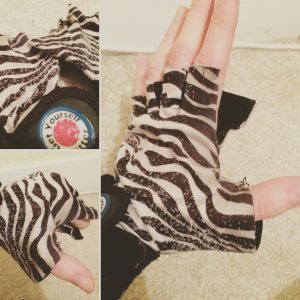 I bought these on Amazon for as cheap as possible, clearly picking fashion over function and used them for every weight I have lifted, every pull of the rowing machine, many kettlebell snatches and the occasional bike ride (and crash!). That’s four years of excellent service from these lil guys! When I think about it like that I can’t quite believe the amount of hours of excercise and training I have achieved. Without trying to blow my own horn, I’m pretty proud of my progress so far. So I say farewell to my little buddies that have seen me through till now. They’re frayed at the edges, theres damaged bits of fluff from where the velcro picks at the design, and all around the grip the stitching is ripped..but I will miss them! I might even just keep them at the bottom of my gym bag for another few months..just to get the absolute maximum use from them. I clearly have attachment issues! So next time you pick up a dumbell say thanks to your gloves, or if you don’t have a pair..you know what to do..
exercise gym positive change sportswear trainingLeave a Comment on My Trusty Gym Gloves..
Like a lot of young people, at the start of it all, when I was about 18 and studying at college, all I wanted to do was unlock the key of how to get skinny and more importantly..STAY SKINNY. 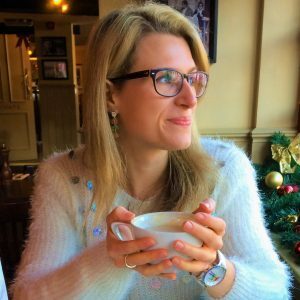 Now I look back I realise that my thoughts on having a nice figure were a little off-kilter with a healthy lifestyle, but this is how my un-balanced (and to be quite honest, un-happy!) day would pan out. Eating: Every calorie counted, every little bit of food to cross my lips had a value and was getting me closer to my oh-so-small daily allowance. I wasn’t working out at all, so aside from the long walk to and from college, I wasn’t giving my body the opportunity to burn off the food I was ingesting, so in my mind, the calories I got through had to be minimal..or I’d get fat. Mistake To Avoid: Don’t starve. Don’t focus on calories like they are the key. Diet is very important, but remember your body burns an amount of calories in each given day just to function (your basal metabolic rate). Make sure you always have enough fuel to keep your body running like a well oiled machine. Exercise: Non existant. To give myself some credit, I was studying far from where I lived so by the time I’d taken two trains and walked a couple of miles with a guitar and books (the joys of being a music student..), I’m sure it accounted for something. But I had nothing else going on. No gym classes or hobbies like netball. Mistake To Avoid: Thinking that exercise isn’t important. Yes, you can lose weight without it, but it’s much better to incorporate some light exercise into your life, not just to keep your body looking nice, but to keep your mind healthy. I can’t believe what I was missing. It’ll be really hard to start with if you’re new to it, but as time goes on you will value this key part of your life that was gone for so long! The Goal: 18 Year old Chrissy’s top priority was to have no fat and to weigh in as small as possible, the scales don’t lie, I thought. Mistake To Avoid: Don’t set unrealistic goals. It always led me to disspointment, eg: the scales say I’m three pounds lighter that my goal weight, so why do I still have a paunchy belly? It does not work that way. Your body is a machine with lots of elements that cause the dial on the scales to move. Water weight before your period, does that count? Also, muscle development will add weight but doing excercise will make you lose fat, so it’s hard to get an overall assessment just from a weigh in. You’ll know when the going is good from what you see in the mirror. Looking back at where I stumbled, it all seems so obvious now, but when you are just starting and have no guidance you do it the hard way, learning from your mistakes. Does any of the above resonate with you? Start to learn your bad habits and try to retrain your mind to think about them in a different light. So you want to be skinny? Ask yourself, is that really what you want? Can you maintain your life so you look that way? Would you rather be healthy and the weight loss comes as a result?